You already know how to use bindings to transfer values between properties, trigger parameters and action parameters. Now imagine you need to transform the source value before transferring it to the binding target. You can achieve this using a converter. The conversion can be as simple as adding 10 to the input value to something as complex as use of a custom script with conditions. The majority of converters are available in all Composer Editions, including the Free Edition. Current converters work with a single input. Future converters will work with multiple inputs to generate a single output, adding even more flexibility. 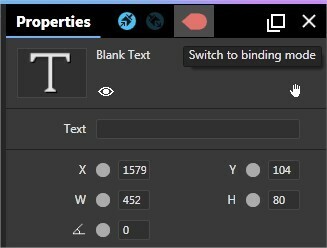 Use the Properties panel for every Asset and Collection to access binding converters. The following converters ship with Intuiface. 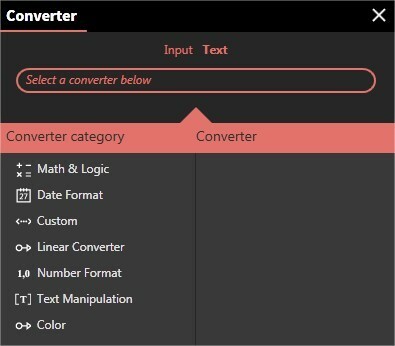 To create your own converter, see this section below. Number Format: convert numeric values, specify the number of decimals, add local currency symbols, etc. Custom Script: [for Composer Enterprise users only] Use scripting to create complex transformation formulas, like an if ... then ... else ... statement. a second Property of the same asset or a different one. This type of binding is defined here. 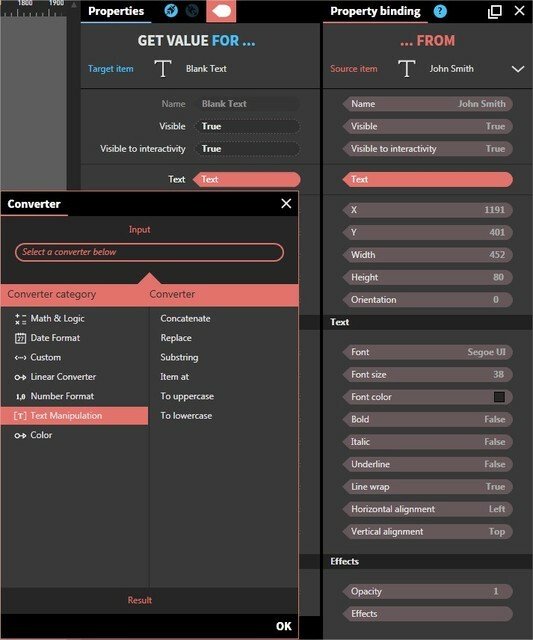 a Trigger Parameter. This type of binding is defined here. 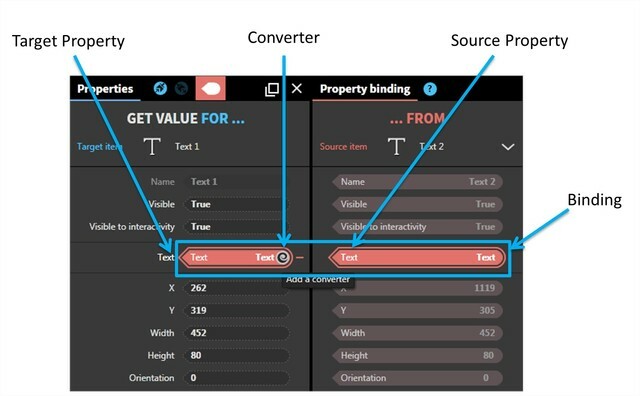 This example illustrates how to use a converter with property-to-property binding. We will place Hello in front of the text John Smith. Create two Text assets. Leave one blank and type John Smith into the other. 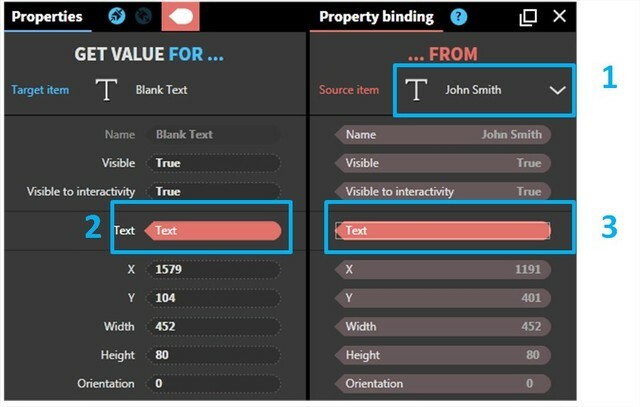 Open the Properties panel for the blank Text asset and then display the Binding panel. 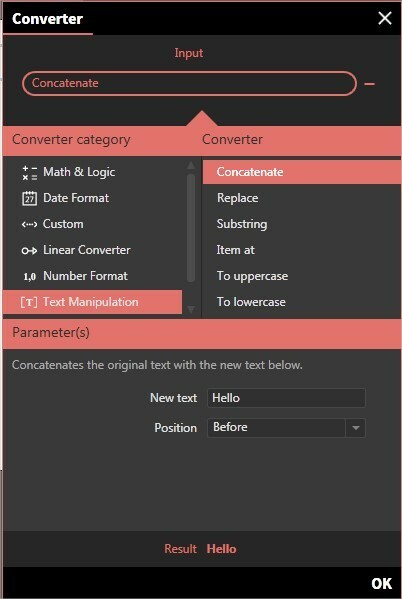 Use the Concatenate converter to add the word "Hello" in front of the text John Smith.